Lead screws are hard to come by, and expensive and therefore the reprap community has embraced the less than ideal threaded rod lead screw principle. 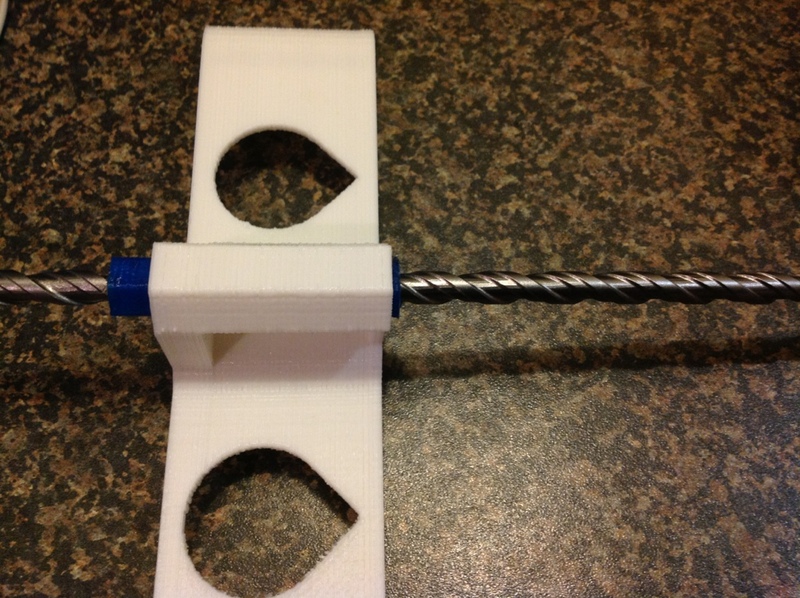 This little experiment is based on a long 8mm SDS concrete drill bit. It has a complex, but blunted screw section, normally removing concrete dust from the hole it is making, but it was easy enough to emulate using an openscad script. I will use it on the upcoming build as an alternative to the standard m8 or m6 treaded rods. The L298 drivers works well enough for high power, high reduction ratio projects, but in this project they will probably not have the required resolution required to get decent quality prints. My motors are currently on 32th uStepping, and when I last tried 298 I could only get 4th uStepping. I recommend getting RAMPS or similar electronics for this project. The Max32 has 5 PWM outputs. In theory you could pair the PWM outputs and use some steering logic to guide each pair of PWM outputs into the right stepper. That only gets you two steppers at best though. If you move to using RAMPS, be aware that the Max32 is a 3.3v device (although it’s tolerant of 5v inputs), so you’d need to make some modifications to RAMPS. Additionally, some of the firmware would need to be re-written, as it’s very closely tied to the underlying ATMega platform. I’m in the same boat, having a Uno32 that I intend to use – as and when I can afford to get the rest of the compents! Are you planning to seld the plastic kit? If only I had more free time to allocate to the project. Progress is not to bad for somebody that has to earn a living by day as well! Expect news in the next weeks. How much does that drill bit cost? It seems as if some guys are having decent luck buying 10×3 and 12×3 lead screws from The Screw Man (in Pretoria) for about R200 in meter lengths. The drill bit is more expensive. At the time that I looked for lead screw nobody had, or they had lead screw fit for lifting concrete slabs. I need 8mm lead screw for my design. I could make the 10mm work with some modification. Will investigate. I know this is quite an old post, but I’m curious if you were ever able to find leadscrews or get the drillbit to work? Hey Quentino, I need to ask i now that I am digging the grave but, How did you configure the software for the drill bit ? Thanks for your fast and kind replay, you won’t believe it that I was planning to use drill bit for a delta project, I wanted to search if anyone else had this idea and my searchs lead me to you 🙂 I am glad you used and got good results with it. I have used a 8 mm drill bit, too. I couln’t be sure in the photo, can you please tell me if yours have the same pattern with this one ? Mine is very similar, but not the same. The principal to calibrate it is very simple. 1. Get the current Z steps per mm in your software. 2. Devise a way you can measure z movement precisely. I use a. Ernier caliper. 3. Use pronterface or similar and move Z a set amount. 4. Measure the amount really moved.